ERDAS IMAGINE is a geospatial data authoring software that incorporates geospatial image processing and analysis, remote sensing, and GIS capabilities into a single powerful, convenient package. 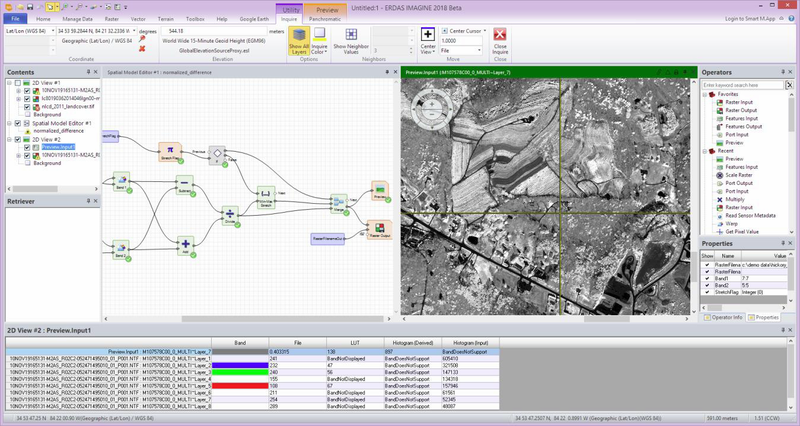 Consolidated Workflow: ERDAS IMAGINE Integrates multiple geospatial technologies, intuitively guiding a user through their experience with powerful tools and functionality for image processing and analysis. Seamless: ERDAS IMAGINE simplifies classification, orthorectification, mosaicking, reprojection, and image interpretation while maintaining the integrity of the geospatial data you need for updating your GIS in multiple formats. Enjoy Faster Data Processing: ERDAS IMAGINE allows you to utilize a robust multi-core and distributed batch processing available for almost any processing job. Smarter Processing: ERDAS IMAGINE simplifies the creation of informative data, with Machine Learning operators that allow you to extract features you’re looking for in vast amounts of imagery more quickly and accurately. Flexible: Available in three product tiers, ERDAS IMAGINE is capable of handling any geospatial task with remarkably fast viewing and processing performance, even when handling massive data sets from any sensor in any format, dynamically.